Arrive Moscow and check into your Hotel. Free time at leisure at GUM shopping center & Red Square. Overnight in Moscow. Buffet Breakfast at the hotel. Proceed on a Guided panoramic city tour of Moscow, which includes the iconic Red Square and the stunning St. Basil's Cathedral with its colourful onion-shaped domes. Proceed for Kremlin, the 'walled fortress' of Russia that holds much of its history, politics and religion. The walls, originally of white stone, were rebuilt in the late 15th century, in their distinctive red brick. Today, the Kremlin houses four cathedrals, three palaces and two museums and is the official residence of the Russian President. It holds many treasures of the former Czars. What was once the Kremlin's Armoury Chamber, has been made into a museum of sorts. Proceed for a metro tour. The stations of Moscow's subway system are often called 'the peoples palaces' for the elegant Soviet-era design and the lavish and profuse use of marble, mosaics, sculptures and chandeliers. Enjoy the world famous Russian Circus. Overnight in Moscow. Buffet Breakfast at the hotel. Depart to visit Sergiev Possad The history of the city of Sergiev Posad closely connected with the name of Saint Sergiy Radonezhskiy, who, when he became a monarch, founded The Troitse-Sergiev monastery. Today it is an active monastery. In 1340 monk Sergius of Radonezh founded a small wooden temple deep in the midst of Russian forest, and gradually it became the biggest monastery in Russia. For many centuries, this tomb has been the place of pilgrimage for orthodox believers. Proceed to visit the Troitse Sergiev Monastery. The Trinity Lavra of St. Sergius is the most important Russian monastery and the spiritual centre of the Russian Orthodox Church. Overnight in Moscow. Buffet Breakfast at the hotel. Check out and proceed to the station for your high-speed train to Moscow. This sleek "Peregrine Falcon", when it begins its renowned hunting dive, achieves speeds of 330 kilometres per hour (205 miles per hour). On arrival, enjoy a panoramic city tour of the cultural capital of Russia. View the dreamy and picturesque River Neva; see the Alexander Nevsky Monastery and Nevsky Prospect lined with the marble palaces of Russian Royalty. Soak in the rich history of St. Petersburg in the Church of the Spilled Blood, the Admiralty, St. Isaac's Cathedral, the Winter Palace. Overnight in St. Petersburg. Buffet Breakfast at the hotel. Drive down to Peterhof, residence of the Czars of yore. Enjoy visiting the Grand Palace and be amazed with its fascinating & elaborate interiors. This world-famous Palace, Fountain and Park ensemble of Peterhof shines forth as a glittering landmark of Russia's aesthetic culture in the 18th and 19th centuries. Its wonderful parks, 176 fountains of various forms, majestic palaces, numerous gilded statues of ancient gods and heroes, paintings and works of art and culture make Peterhof a veritable gem of art, often called the 'Capital of Fountains,' unique in the world. Later proceed to the celebrated Hermitage Museum, one of the most important museums in the world. It houses a fabulous collection of nearly three million works of applied art, archaeological finds, coins, graphic art and paintings in six different buildings. Overnight in St.Petersburg. Buffet Breakfast at the hotel. proceed to see the Peter and Paul fortress. Established in 1703 by Peter the Great, the Peter and Paul Fortress has held some high-profile criminals in its prison cells, including 'Crime and Punishment' author Fyodor Dostoevsky and Lenin's right-hand man, Leon Trotsky. The fortress is also home to the famous Cathedral of St Peter and Paul, the city's oldest, dating back to 1712. The cathedral's majestic bell tower and its flying angel figurine exemplify the city's architectural splendor. Later, proceed to the St. Isaac Cathedral which was originally the city's main church and the largest cathedral in Russia. It was built between 1818 and 1858, by the French- born architect Auguste Montferrand, to be one of the most impressive landmarks of Russian Imperial capital. One hundred and eighty years later the guilded dome of St. Isaac's still dominates the skyline of St. Petersburg. Enjoy a boat ride along the canals of St. Petersburg from where you can view the city's grand neoclassical architecture. Overnight in St.Petersburg. Buffet Breakfast at the hotel. take a high-speed "Allegro" train from St. Petersburg to Helsinki. Upon arrival into Helsinki, enjoy guided city tour of Helsinki which includes modern Finlandia Hall, the leading congress, event and entertainment venue in Finland; Sibelius Monument - dedicated to the Finnish Composer, Jean Sibelius, consisting of a series of more than 600 hollow steel pipes welded together in a wave-like pattern; Helsinki Cathedral - the impressive green-domed Lutheran Cathedral which dominates Senate Square and the Helsinki skyline; the unique Rock Church - a thrilling work of modern architecture, built entirely underground with a ceiling made of copper wire; and the Market Square bustling with activities with vendors selling fresh food and souvenirs. Some free time to shop. Overnight in Helsinki. Buffet Breakfast at the hotel. Day is free at leisure to explore Helsinki on your own. Transfer from hotel to the Silja Line (Inside cabins, Dinner buffet included) for Helsinki-Stockholm. Overnight in Cruise. Buffet Breakfast at Cruise. Arrive Stockholm and transfer to your Hotel. Day is free at leisure to explore on own. Overnight in Stockholm. Buffet Breakfast at Cruise. 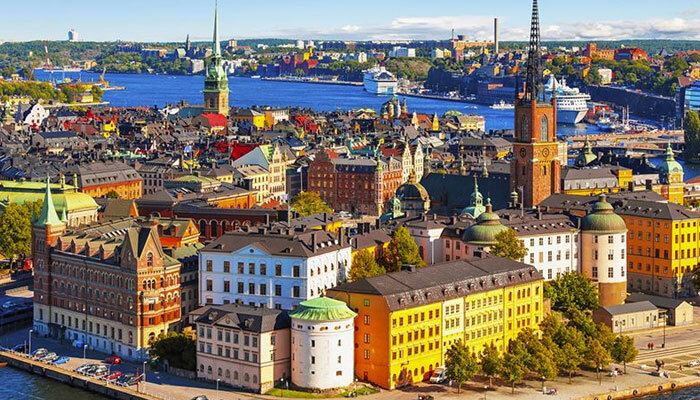 Guided city tour of Stockholm including pass through Kungsholmen, Fjällgatan, the old town and many more sights. Stockholm Sightseeing Cruise.Overnight in Stockholm. Buffet Breakfast at the hotel. transfer from hotel to Oslo via Karlstad.Orientation tour of Karlstad.Arrive in Oslo and check into your Hotel. Overnight in Oslo. Buffet Breakfast at the hotel. transfer from hotel and proceed to Geilo. Arrive Geilo and check into your hotel. Rest of the day is free at leisure to explore on your own.Overnight at Geilo. After breakfast, proceed to Geilo train station to continue the Norway in Nutshell. Train Geilo to Myrdal. Mountain train Flambana, from Myrdal to Flam.Fjord cruise from Flam to Gundvangen. Transfer from Gundvangen to Voss. Pickup from the Voss station to drop at the hotel.Overnight in Voss. Buffet Breakfast at the hotel. check out and transfer to Bergen from Voss. Arrive Bergen and check into your hotel.Rest of the day is free at leisure to explore Bergen on own. Overnight in Bergen. Buffet Breakfast at the hotel. check out and transfer to Ovre Ardal. Enjoy the scenic drive. Overnight in Geiranger. Buffet Breakfast at the hotel. check out and transfer to Oslo. Orientation tour of Lillehammer.Overnight in Oslo. Buffet Breakfast at the hotel. Guided city tour of Oslo. Meet the guide at city center in front of Vigeland Sculpture Park. Guided Tour of Oslo. Holmenkollen Jump,Akerskus Castle (outside look) and Vigeland Sculpture Park. Transfer to the Pier to board your Overnight Cruise.Overnight in DFDS ferry to Copenhagen, outside cabin incl. Overnight in Cruise. Buffet Breakfast at the hotel. Guided city tour of Copenhagen. City Sightseeing including Visit Little Mermaid, have outside look of Amalienborg Palace (including the Royal guard change if time permits), Christiansborg, Parliament and outside look of the Opera house, Nyhavn and many more sights. Enjoy and get amused in the Tivoli Garden (Entrance).Enjoy exploring Copenhagen on your own. Overnight in Copenhagen.